Annual state pension payments to CalPERS are expected to increase $200 million to a total of $4 billion in July. But the rate may go higher as the powerful pension board takes a new look at its risks and policies. The nation’s largest public pension fund last week gave a joint legislative committee an update on its funding status and plans for the future, as required by recent legislation. The giant pension fund covers 1,576 local governments and non-teaching employees in 1,488 school districts, but the annual payment for state workers draws the most attention. When former Gov. Arnold Schwarzenegger briefly backed a proposal to switch new state and local government hires to 401(k)-style plans, he cited soaring state worker pension costs. 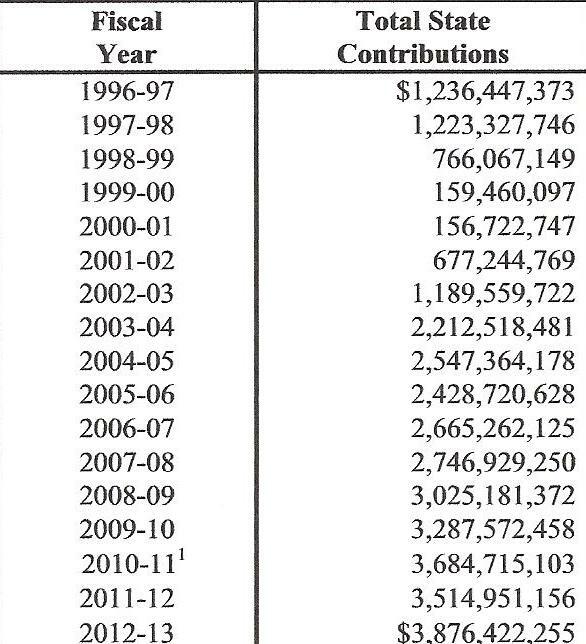 CalPERS dropped the state rate from $1.2 billion in 1997-98 to less than $160 million in 1999-00 and 2000-01. A booming market yielded a brief surplus, and CalPERS spread the wealth by sponsoring a major state worker pension increase, SB 400 in 1999. But the market fell and the surplus vanished, causing CalPERS to push the taxpayer-paid state rate to $2.5 billion in 2004-05. Schwarzenegger cited skyrocketing pension costs as he urged a switch to debt-free individual investment plans. Then a recession and market crash punched a huge hole in CalPERS investments expected to provide two-thirds of pension money. After peaking at $260 billion in 2007, the fund dropped to $160 billion in 2009 and now has climbed back to $255 billion. The state payment to CalPERS jumped from $2.7 billion in 2007 to the current $3.8 billion. But this 40 percent increase over five years is far short of the eye-popping “2,000 percent” increase over five years cited by Schwarzenegger. This time, employers had not been given a contribution “holiday.” State workers aided by agreeing to increase their pension contributions, though Schwarzenegger had to hold up the budget for 100 days to get a boost from 5 percent of pay to 8 percent for most. CalPERS adopted actuarial policies aimed at avoiding rate “shock,” a big jump in annual employer costs. And CalPERS did not impose the big rate increase, probably several billion dollars, needed to project 100 percent funding over the next 30 years. The funding level for state worker plans dropped to 58 percent in 2009 but is now moving in the right direction: 63 percent in 2010 and 70 percent last June. The amount of the shortfall last year, the “unfunded liability,” was $38.5 billion. A pension unfunded liability is sometimes viewed as if it’s a firm debt that must be paid, much like a bond or a mortgage. But it’s a 30-year projection of the gap between assets and liabilities, which can change a little or a lot and may never be closed. A big variable is the earnings forecast. Stanford graduate students showed what happens when the earnings forecast of three state pension funds, then 7.75 percent, was lowered to a “risk-free” bond rate, 4 percent. The unfunded liability ballooned tenfold. Actuaries say the California State Teachers Retirement System, with a $64 billion unfunded liability, would be fully funded if earnings averaged 17 percent for five years and then hit the 7.5 percent earnings target in the long run, unlikely but not impossible. Other variables: actuarial methods for valuing assets, recording gains and losses and setting the length of time for paying off debt. The unfunded liability is based on full funding over 30 years, but pension funds rarely reach full funding. When a retirement system reaches full funding, it’s often been regarded as a celebratory occasion for splitting a “surplus,” cutting contributions for employers and giving employees a pension increase. The negatives of a big unfunded liability: little cushion if another deep recession wipes out a quarter of the investment fund, fewer investment earnings to reduce employer contributions and passing on more debt to future generations. At the legislative committee last week, the new chairman of the Senate retirement committee, Jim Beall, D-San Jose, asked about the plan for handling the CalPERS unfunded liability, noting that he had worked on one as a county supervisor. Stausboll said Gov. Brown’s pension reform last year, AB 340, was originally estimated to save CalPERS $40 billion to $55 billion over 30 years. Most of the cuts are for new hires, taking decades to help narrow the funding gap. “As we think of heading toward 100 percent funded status as our goal, that’s not something that’s going to be happening in a few years,” said Stausboll, who listed three CalPERS priorities. 1) Implementing the pension reform. The staff work includes computer and publication changes. A followup bill, SB 13, will clarify technical issues. With a lot of “stakeholder input,” CalPERS plans to issue regulations this month and in March. 2) State and local government fiscal challenges. CalPERS works with employers on costs and estimates for future budgets. In the Stockton and San Bernardino bankruptcies, the goal is preserving a sound retirement system while hoping the cities stay in CalPERS. John Bartel, an independent actuary, gave the committee a report from the California Actuarial Advisory Panel on the status of CalPERS. The panel is still working on policy and practice guidelines for public pensions and retiree health plans. Bartel said the goal of actuaries is to reach 100 percent funding. But future events are unknowable, he said, so the goal is “a movable target” requiring contribution adjustments. He made a comparison with seeing a rainbow while driving in a car. Bartel said the CalPERS “amortization” period for paying pension debt is twice as long as the average worker is expected to remain on the job. He said CalPERS may shorten the amortization, aligning the debt with payments from current taxpayers. A shorter amortization could lead to higher contributions. Among other factors: a rapidly growing number of state and local government retirees during the last decade, increasing the ratio of retirees to active workers. This entry was posted on February 7, 2013 at 9:12 am and is filed under CalPERS, Rates. You can follow any responses to this entry through the RSS 2.0 feed. You can skip to the end and leave a response. Pinging is currently not allowed. You do that by STOPPING the daily digging of the financial hole we are in even deeper ….. by freezing the current DB Plans for all CURRENT workers, and replacing it for future service with a DC Plan with a modest taxpayer “match” of 3-5% of pay …… just like Private Sector Taxpayers typically get towards their retirement. And then I woke up ….. THIS is Crazyfornia ! DC plans have way higher fees than DB plans, and also pay heirs of the employee, instead of just the employee who did the work. DB plans, per dollar input, are way more economical than DC plans. Concerning this increase in CalPERS contribution… the new total exceeds the State contribution to the University of California… which is $2.9 billion/year for 2013-14. That is pretty sad. As I’ve said many times, benefits are too high in California. A coordinated and progressive plan to reduce benefits, also for existing retirees and employees, not just new ones, is needed. I don’t want to cut a retired schoolteacher or any other State retiree who worked 35+ years and makes <$50,000 on their pension. But for example, Mark Yudof of UC will get a $200,000/year pension after working at UC for 5 years. Or all the City of Bell people, etc. Anything above $50,000/year for 35+ years of service should get progressively cut. Spension ….. Blah Blah Blah every time. ANY advantage DB Plans may have over DC Plans … and it’s a VERY minor one when you count all the moving parts …. that advantage is VASTLY overshadowed by the ability (ONLY under DB Plans) of our self-interested politicians to abuse Taxpayers by enhancing DB pensions … often RETROACTIVELY. No, Spension. My former CM from a City of 36,000 population gets approximately $325,000. That is excessive–but it was done legally, Our City Council was soooo generous to him, in giving him privately, negotiated benefits above and beyond the CalPERS cap which is approximately $209,000. (No union there TL.) What is done is done. I would never advocate retroactively taking away benefits that were obtained legally. The new state pension reform plan has capped benefits at somewhere in the neighborhood of $110,000. And people say nothing has been done! Its only 2% of the retirees who get benefits over $100,000 anyway. There was never a problem regarding the other 98%. Pull the shades down in your crow’s nest, TL. Nothing to see here in CA. We have much worse problems than pensions that are too generous. Retroactively enhancing pension- benefits in CA was the usual in CA for all the years of the DB pensions, TL. Unions didn’t even come into the picture until CalPERS was 45 years old. The new pension reform legislation abolishes the practice. You can go to sleep now. SeeSaw… lots of legal contracts in the private sector are nullified due to bankruptcy. An unwise deal is, in those cases, not immortal. I understand the strength of the agreements over pensions… the only analog to bankruptcy for the State of California is Sovereign Default, which has occurred in US history for a number of states. State-level public bonds have been defaulted upon. If there is no other way to reduce pension commitments, I do advocate that mechanism. I think benefits for DB plans in California have risen to the unwise level. 40% of salary is just too high… sorry about that. Yes, legally given, but frankly the balance between education (K-12 and Higher) and post-retirement benefits is way out of whack. Maybe the stock market will roar back and the point will become moot. That is a *huge* deal. Many public pension systems in the US *have not* suffered from “by the ability (ONLY under DB Plans) of our self-interested politicians to abuse Taxpayers by enhancing DB pensions … often RETROACTIVELY.”. At my former employer, the costs for miscellaneous employees is 23% of salary; 49% for safety. Spension, Do you realize your incorrect conclusions (and yes, they are incorrect) are coming from (your quoted source) http://www.nirsonline.org, an umbrella organization for Public Sector Retirement Plans. It shouldn’t take a genius to realize that this organization is extremely biased in favor of DB Plans. Tough Love… numbers are numbers and numbers are facts. DB plans, well managed, are simply numerically more efficient than DC plans for multiple reasons. Questioning that fact is like questioning whether gravity exists, but feel free.. you might also want to question whether smoking causes cancer or whether or not the stork brings babies. That California messed up is totally clear, but *DB plans are not the problem*. Whatever the source of data, there is no doubt at all that well-run public DB plans exist in our country and other countries. The reason DB plans are used is: they are mathematically more efficient, period. Of course, Tough Love, the investment industry lobbies like the dickens to get DC plans (like mine) instituted. It is as disgusting pay-for-play as exists. The investment industry wants the high fees… you never come to grips with that problem, Tough Love. In contrast, I agree with you that California’s DB plans got way too expensive because way to high benefits were allowed. And that doesn’t include safety. Spension, how can you continue to make this same nonsensical claim. As I’ve previously stated, I fully self-fund my own DC plan (including fees) and am also expected to fund the normal cost of someone else’s DB plan + the fees + the unfunded liability. I can only conclude the cost savings you mention are only to the benefit of public employee union members that pay ZERO DOLLARS in management fees. That argument is tough to swallow when looking at taxpayer contributions that have doubled or tripled beyond the very generous, Normal Cost of Overly VERY generous pension formulas. Spension, how much additional cost do you think CalPERS POOR management has added to the taxpayer burden/DB plan. CalPERS is a Crooked & Corrupt Ponzi Scheme run by the Unions. Captain… nonsensical? The annual expenses for CalSTRS and UCRP are 0.2%… since these funds have $100’s of billions in them, that is $200 million or so. CalPERS is a bad actor… something your article correctly identifies… and the annual expenses are 0.5%, at the level of $500 million for $100 billion in assets. $300 million a year ain’t chicken feed. at the level of $830 million or so a year for a $100 billion fund. The investment industry drools over getting public systems into DC plans so they can get the extra $630 million a year or so from California’s pension systems (comparing to the 0.2% fees in CalSTRS and UCRP). $630 million/year is not chicken feed. I certainly agree that the benefit rates are too high; I always and consistently say that. The article you link makes the point very well in its text (although it has some needless inflammatory graphics). The article points out that between the 1930’s and 1970’s, the benefits rates were pretty reasonable for CalPERS, but gradually they drifted higher; got reset in 1991, but then upped (by *UNANIMOUS* vote of the California State Legislature, including all Republican reps) in 1999. I agree some ignorant politics and misrepresentation by CalPERS went into that 1999 unanimous vote. Get real, Captain… name calling (`Ponzi Scheme’) gets nowhere. Rationality and respect for facts and mathematics are the only way out. The possibility of Sovereign Default (equivalent of bankruptcy for a State) must be carefully developed. The only other option is voluntary reductions by the stakeholders in CalPERS, CalSTRS, UCRP, LA County pension, etc. But the heart of the problem is *NOT* the fact that public plans are DB. DB are cheaper than DC, and don’t provide dollars to the welfare queens of wall street. And just whom, spension, are they cheaper for? That is what Wall Street will do to your DC plan (and mine) if given 1/2 a chance.